When it comes to selecting fixtures for a scaled-down space, proportion is everything. What kind of lighting do you recommend for a small, 30-inch x 6-foot bathroom with no window? Such a small space can be effectively illuminated with a single fixture mounted above the vanity. The choices available are quite diverse, and in this case, the professional recommendation is for a fixture with two or three shades. Use either incandescent lighting, preferably with a dimmer, or compact fluorescent lighting. Wall sconces are particularly good choices for areas without a lot of floor or counter space for portables. Sconces are capable of providing functional as well as ambient light. They are available as fixtures that can be either hardwired into the wall or plugged into an outlet. A technique called “wall washing” is effective in making spaces appear larger. It involves positioning one or more sconces so that the light grazes the wall, drawing attention outward. The effect can be very dramatic and create a different awareness of a room’s scale. To learn more about selecting and installing sconces for your space, talk to a professionally trained lighting specialist at a Hortons Home Lighting showroom. Choosing the right kind of lighting and paying attention to its placement can instantly make small rooms look more spacious. A dark or poorly lighted home will always feel smaller. For small spaces, it’s best to incorporate accent lighting with functional lighting. A multi-lamp approach is very effective in helping to visually enlarge a living room or bedroom. Place several table lamps and small accent lamps throughout the room. Having multiple points of lighting dramatically increases the psychological perception of the space. Torchieres, which direct light upward, can add dramatic ambient lighting to smaller spaces with vaulted ceilings. When using portables, the lights should not be bright and should actually have relatively low wattage or dimmers. 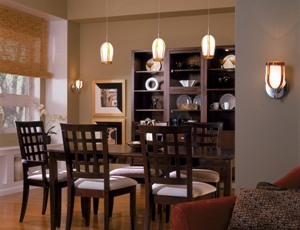 For lamps without built-in dimmers, look for table-top dimmers, available at Hortons Home Lighting showrooms.